For a long time, I didn’t know what passion fruit tasted like. I associated it vaguely with tropical juice blends and artificial fragrances in things like air fresheners and girly shampoos. For some reason, I assumed it was syrupy sweet and generally unappealing. Real passion fruit is tart and fragrant, almost lemony, but somehow fuller and rounder, hitting more complex notes. 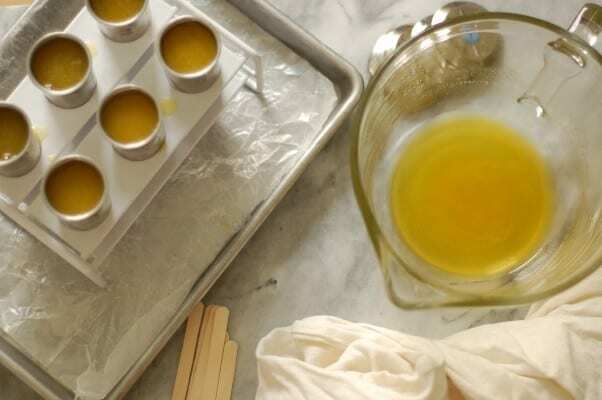 There’s a reason it’s a perennial favorite of pastry chefs. Its potent acidity makes it a great ingredient for balancing sweeter ingredients. 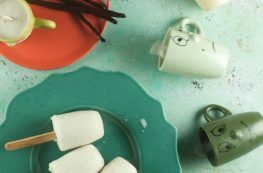 It plays beautifully with things like white chocolate and caramel that can be tooth achingly sweet on their own. It’s become one of my favorite flavors to play around with. Especially when I discovered that I could buy high quality frozen puree on the cheap at my neighborhood Latin grocery store. It’s a shortcut that means I don’t have to track down fresh passion fruit and pulp them to get that intoxicating flavor. 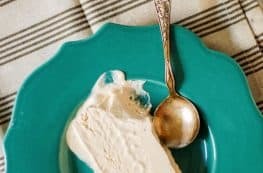 When I saw a recipe for passion fruit-pineapple sorbet in Claudia Fleming’s excellent (and distressingly out-of-print) dessert cookbook The Last Course, I knew that the flavor combination would be a winner. I love pineapple, but it can cross the line to too sweet pretty easily. Passion fruit’s tartness works here to keep that sweetness in check, while the pineapple rounds out passion fruit’s pucker. I’m sure I’ll be returning to this flavor combination again. 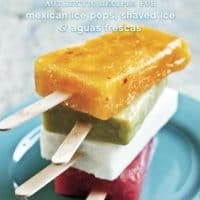 These popsicles are tropical with a great balance of sweetness and tartness. Look for unsweetened frozen passion fruit puree in Latin grocery stores. 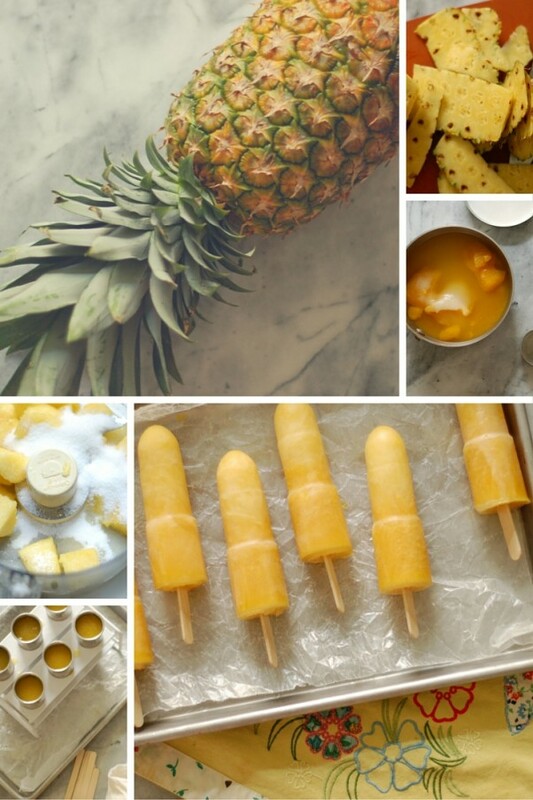 You can use pre-cut pineapple if you want to make this even easier. 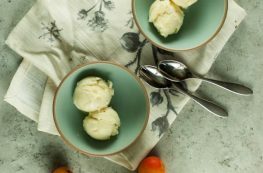 If you have an ice cream maker, you can chill this mixture and spin it into a sorbet like Fleming does. 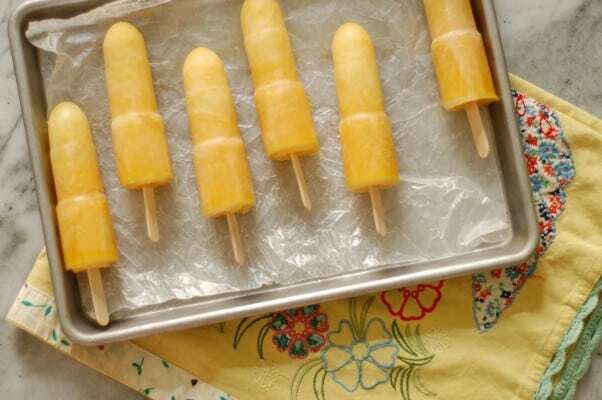 I went the easier route and made them into popsicles in these plastic-free molds. 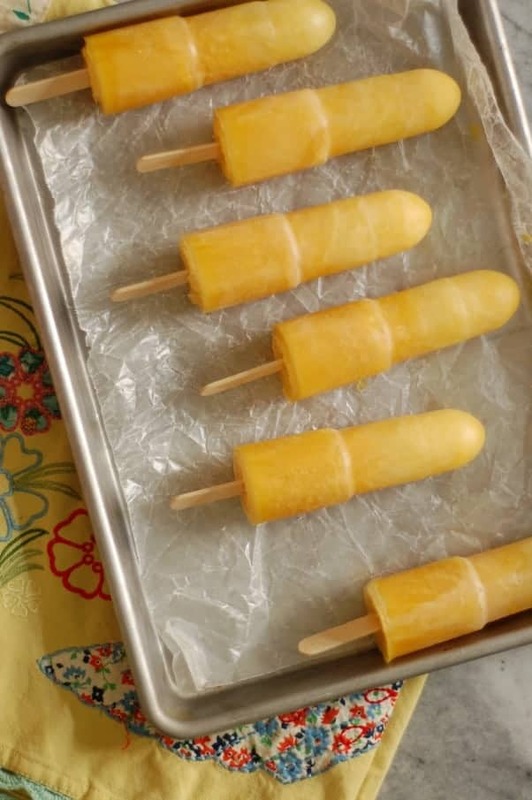 If your mold doesn’t have a lid to hold the popsicle stick in place, wait for about 1 1/2 to 2 hours until the popsicles are partially frozen to add the sticks. 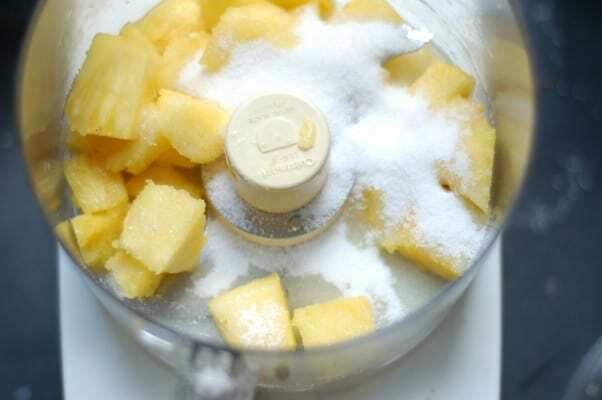 Add the pineapple and 1/4 cup of sugar into the bowl of a food processor or blender and blend until smooth. Let rest for one hour. 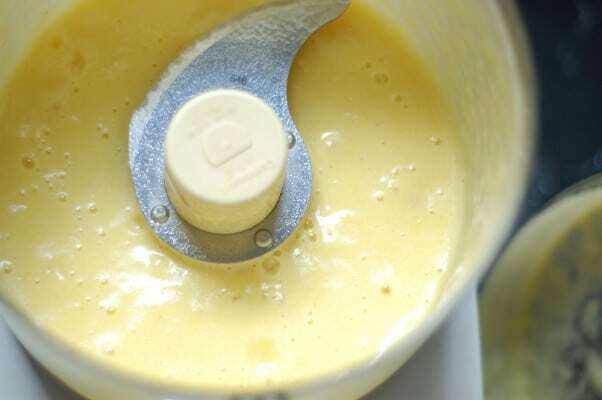 While the pineapple mixture is resting, add the remaining sugar, water, and frozen passion fruit puree to a small heavy bottomed sauce pan and heat over medium heat. 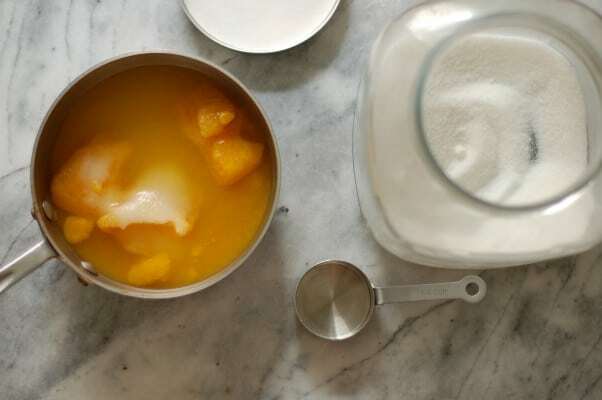 Bring to a simmer, and stir until the passion fruit puree is melted and the sugar is dissolved. Remove from heat and let cool. 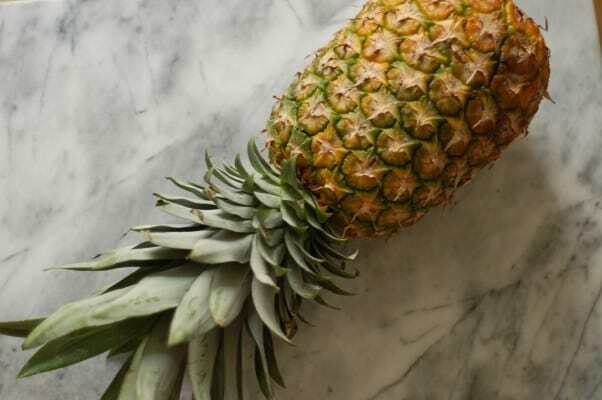 Strain the pineapple mixture through a strainer (really pressing on the solids to get as much smooth puree as possible) and whisk it together with the cooled passion fruit syrup in a mixing bowl (ideally one with a spout). 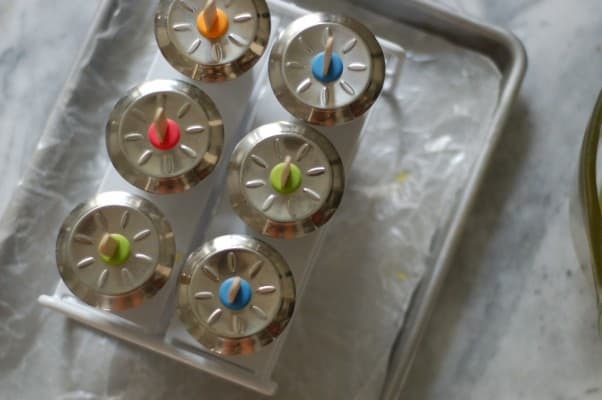 Pour into popsicle molds and freeze until solid, about 4-5 hours depending on your molds.